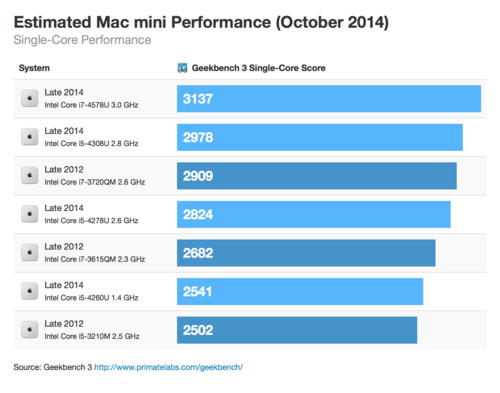 It’s a strange time in the Mac mini market. The Mac mini has always held it’s value well, but right now is different. When the 2014 Mac mini was released, the machine was no longer sold with a quad-core processor and users could no longer upgrade the hard drive and RAM after purchase. We confirmed these things in a blog post that has been read over one million times. My advice to many has been to just to order the Mac mini the way you want it and enjoy. Clarify: I think most people will be pleasantly surprised with the new Mac mini. Good CPU/graphics boost. Just order the way you want it. 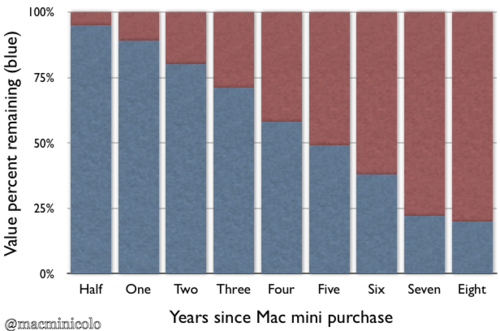 However, there is clearly a market for a more powerful Mac mini. For instance, if you use a Mac mini for automated Xcode builds or to run multiple virtual machines, those quad-core options were pretty important. This brings us to the current market. The last generation Mac mini was released in October 2012. If you purchased the $799 quad-core option, you were able to sell it for about $550 in September of 2014. That’s really an amazing resale value for a two year old computer. But if you take a look on eBay right now, you’ll see that same Mac mini selling for double that amount. The average for a new or lightly used quad-core Mac mini is about $1100. If you have a quad-core Mac mini and use it for watching videos, organizing photos and other simple tasks, you are in a pretty good position right now. You could probably sell your Mac mini, purchase a new one that performs those tasks as well (if not better), and still have some money left over. How often does that happen with a two year old product? 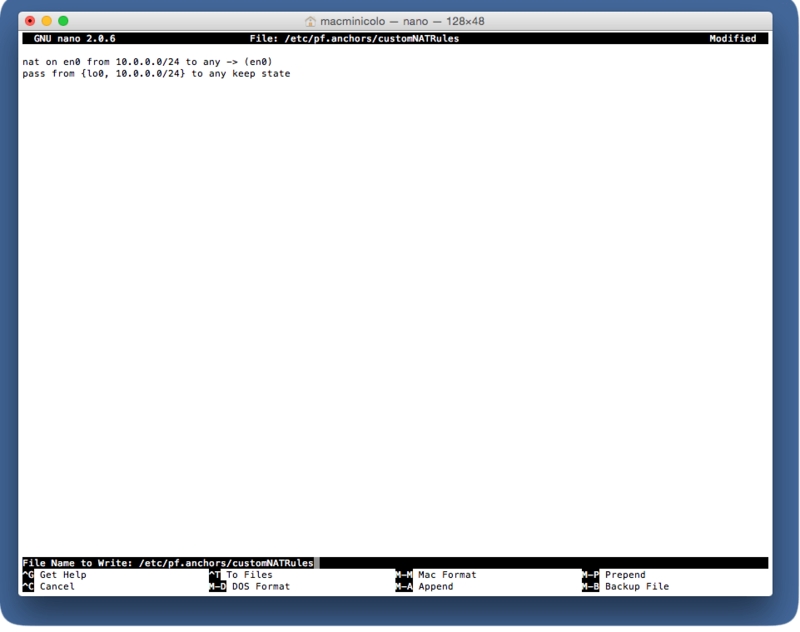 As for Macminicolo, we love all Mac minis of course. Since the new ones start at just $499, it’s nice to see people getting their own dedicated server with a smaller up-front cost. These minis perform great for many customers. For those who need the quad-core power, we still try to find the best deals on lightly used ones and list them on our page of used Mac minis. Any thoughts on the Mac mini, new or old, let us know on twitter. 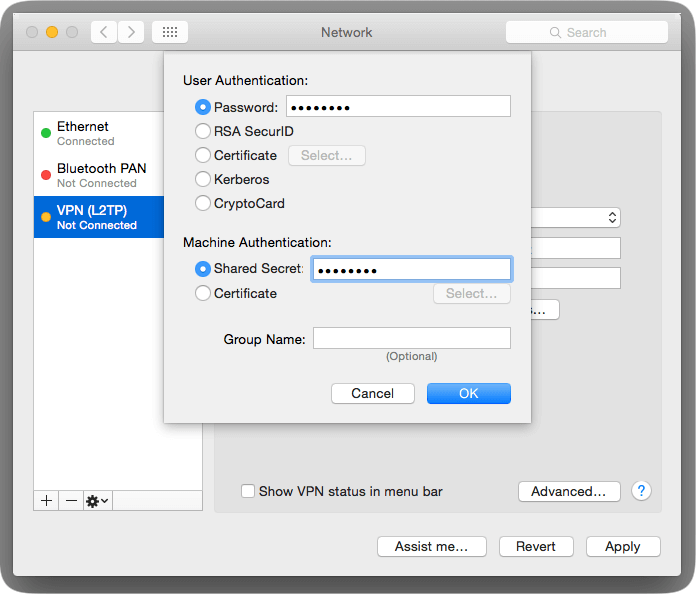 We have a lot of customers who use their Mac mini as a VPN server. This works great when you need an IP address in the US, or a secure internet connection on the road, or a number of other reasons. 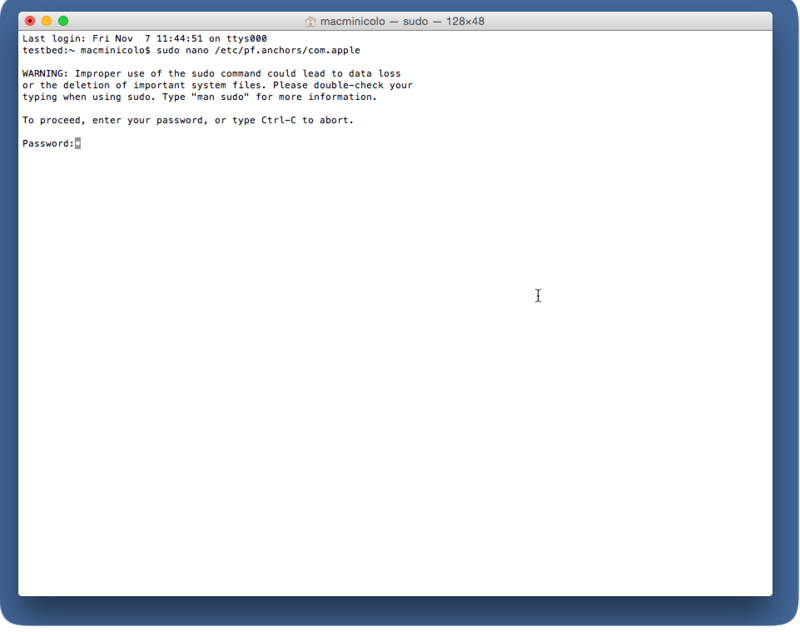 When Apple released Lion, they changed the setup a bit. This continued in Mountain Lion and Mavericks, and remains the case in Yosemite. 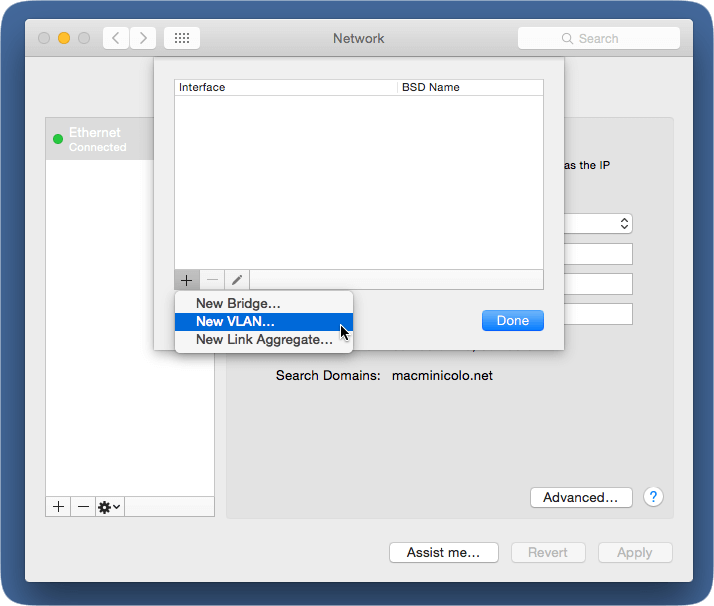 By default, Yosemite Server VPN will distribute IP addresses in the same range the Mac itself uses. 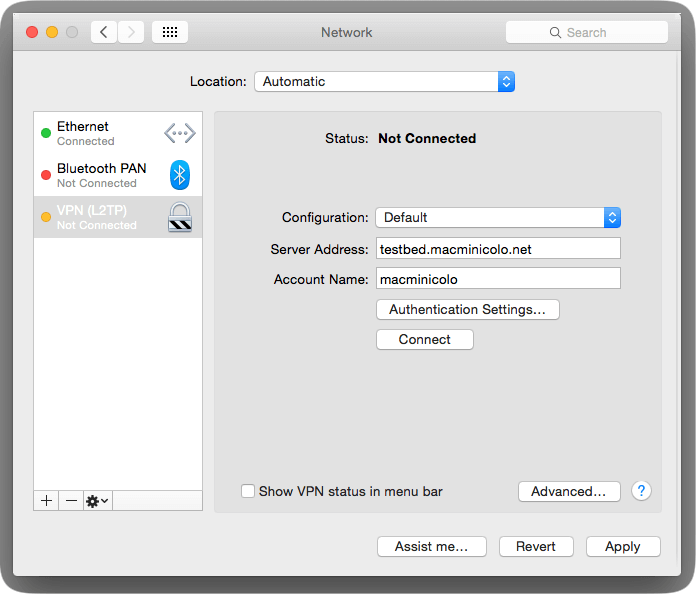 This doesn’t work well in a facility like Macminicolo where each Mac mini has a static WAN IP address. 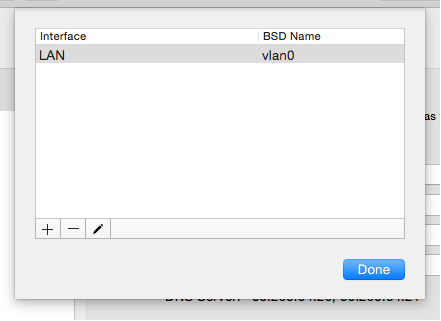 First, let’s set up a VLAN. 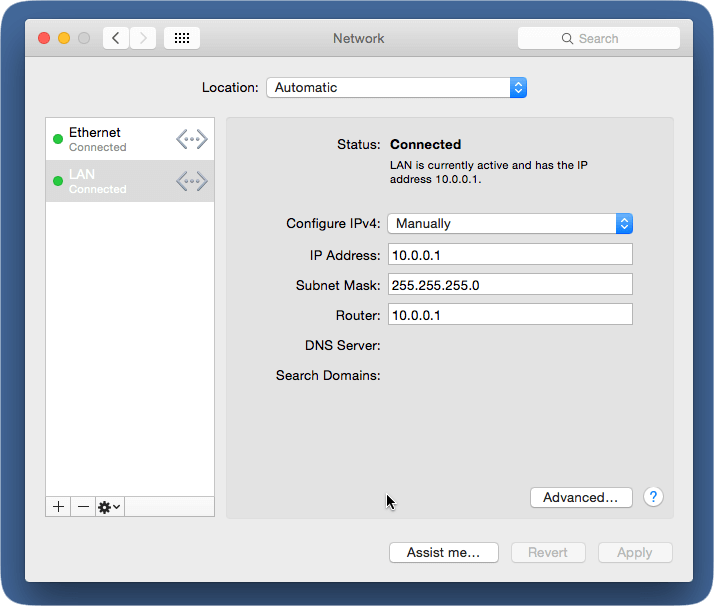 After pressing “Done”, you’ll be able to enter network info for your new VLAN. Make sure to choose “Manually” for “Configure IPv4”, and set the IP Address, Subnet Mask, and Router as shown below. Great. 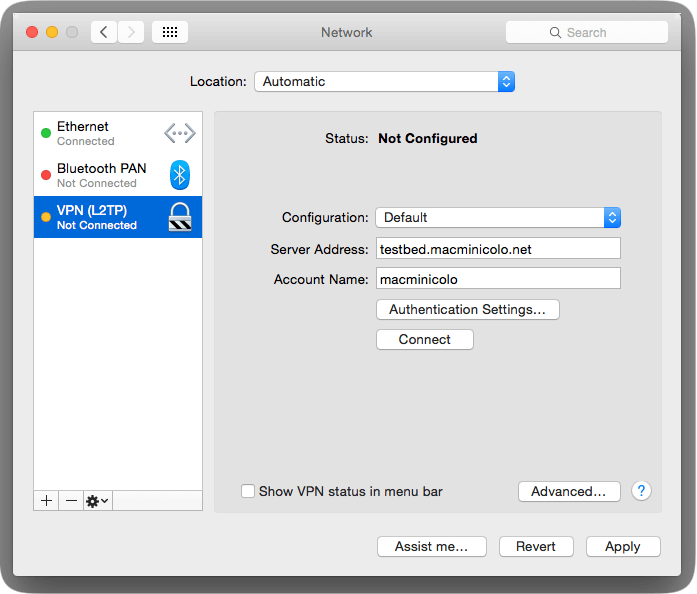 Now, once again, if you are NOT interested in routing public internet traffic from your VPN client(s) over the VPN and out to the internet via your server’s public internet connection at Macminicolo, you should SKIP from here to PART III. So far, so good. 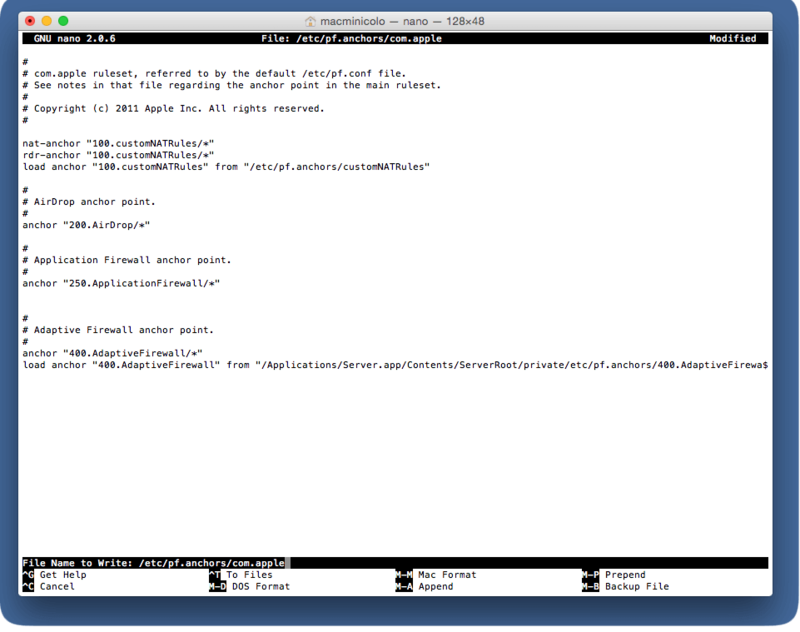 Now things get a little trickier, as we need to dive into the command line a bit to get NAT and routing set up. 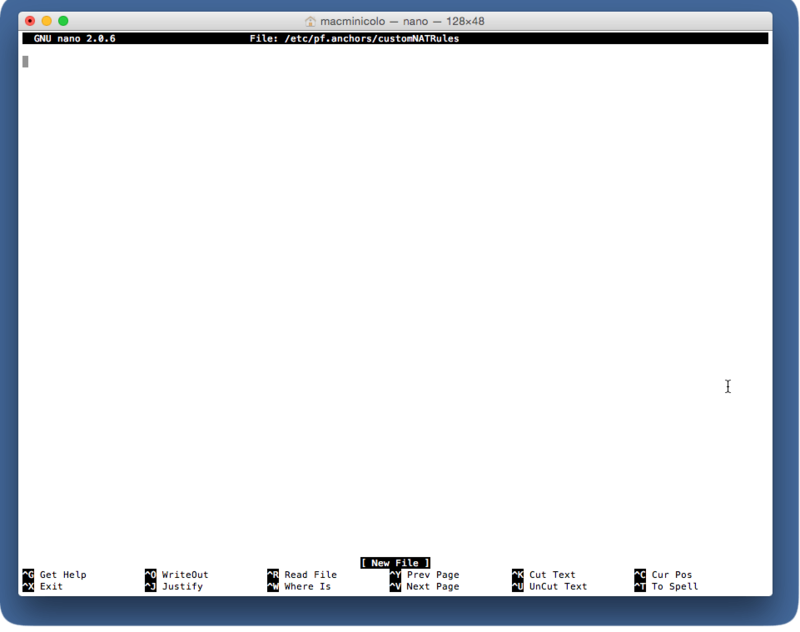 First, we’ll need to edit two privileged text files, so we are going use a command line text editor called nano. Breathe easy, we've got each other's backs here, and we will take this step by step. As we proceed, it is important to remember that in the command line, typos aren't the least bit welcome, and also, uppercase/lowercase needs to match exactly, so it is extremely important to enter text into Terminal.app exactly as it is described here. One additional (but important!) 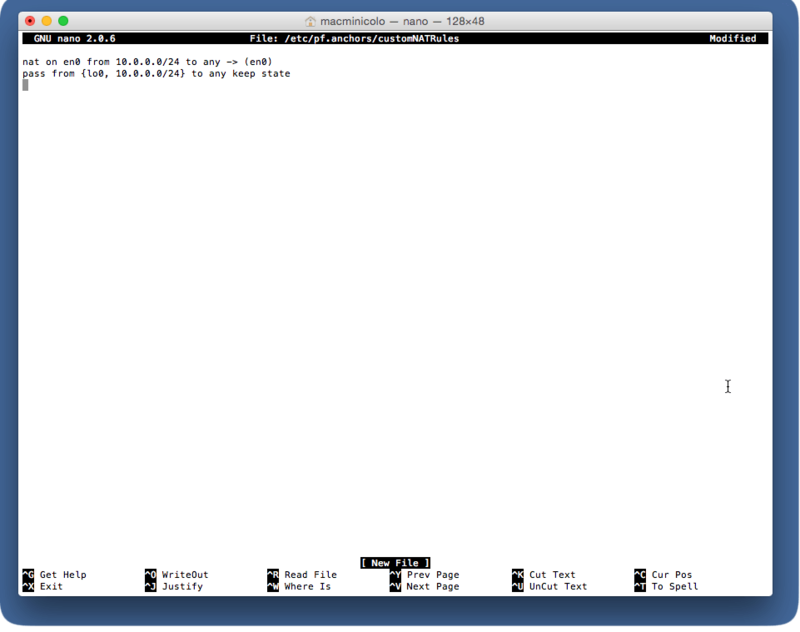 point: The quotation marks used here in terminal commands are "straight" quotes. Some web browsers and text editors may automatically convert these marks to smart (curly) quotes, particularly when copying and pasting. It's important to use straight quotes when entering the commands from this tutorial in Terminal.app. Okay, we are now going to add three custom lines to this document. Red arrows in the picture below indicate where these lines should go. To move the cursor into the correct place to add these lines, simply use the arrow keys on your keyboard. Great. 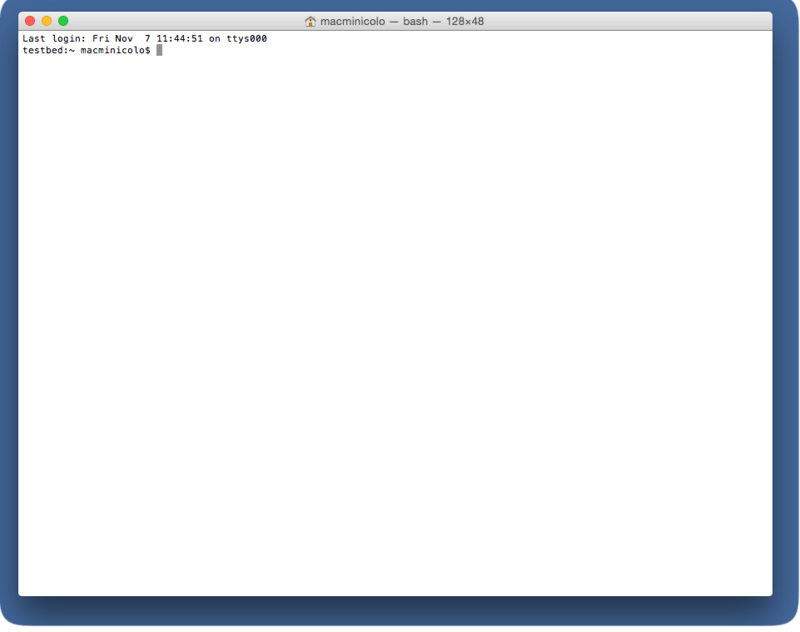 Now we need to tell nano to save the changes you made to this text file. This will be a three step process, and we'll take it one step at a time. Well done! You are back where you started, having edited a text file in nano. And now that these two lines have been added, well, you know the drill, the old three-step save: “control-X”, then “Y”, and then press return. Excellent. Though nano has served us well, we won't need to use it again during this tutorial. 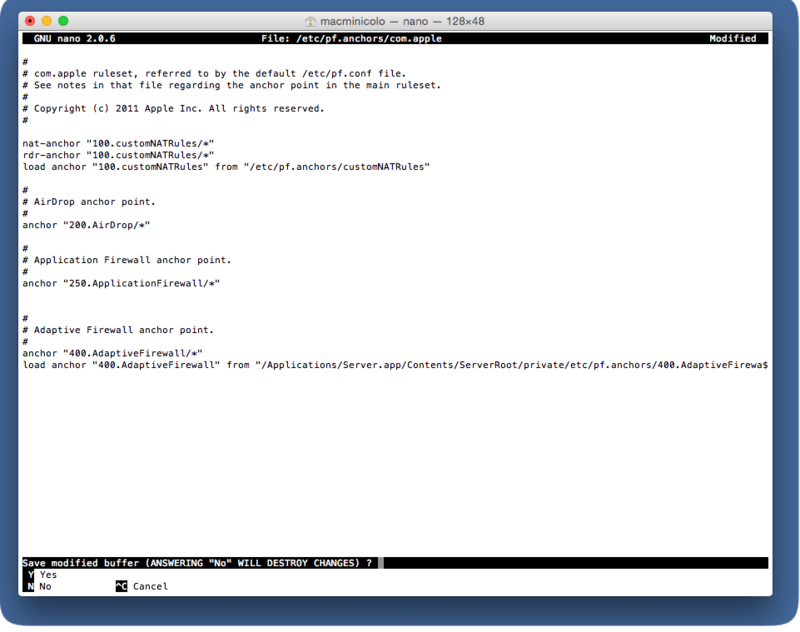 Now, just a couple more commands in Terminal.app, and we’ll be done with the command line altogether. The Terminal should respond with “net.inet.ip.forwarding=1”, which is what we want. Now that you have restarted your server, let’s continue. Several default settings here are already in place as we’d want them, so we’ll just edit a few. 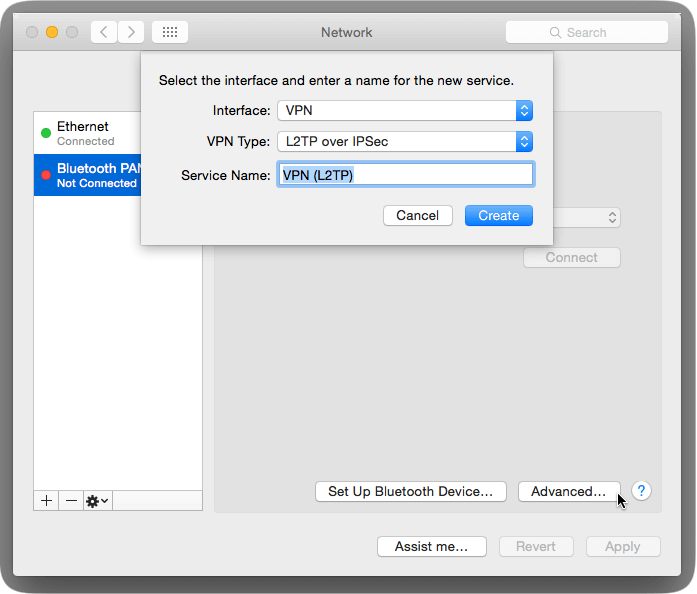 Now that your server’s VPN is configured, enabled, and (optionally) ready to route public internet traffic for its clients, you may want a little guidance on how best to configure a client. Let’s set up a Yosemite client as an example. 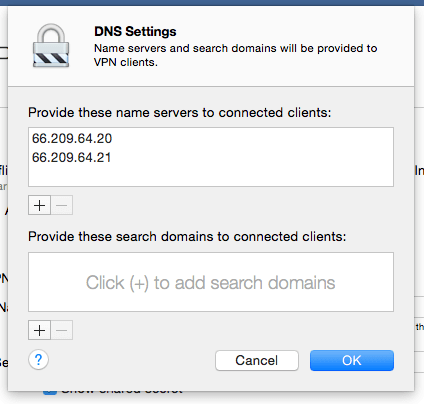 As shown above, enter the IP address or DNS name for your server in the “Server Address” field. In the “Account Name” field, enter the username for the account on the server that you want to use to log in from the client. 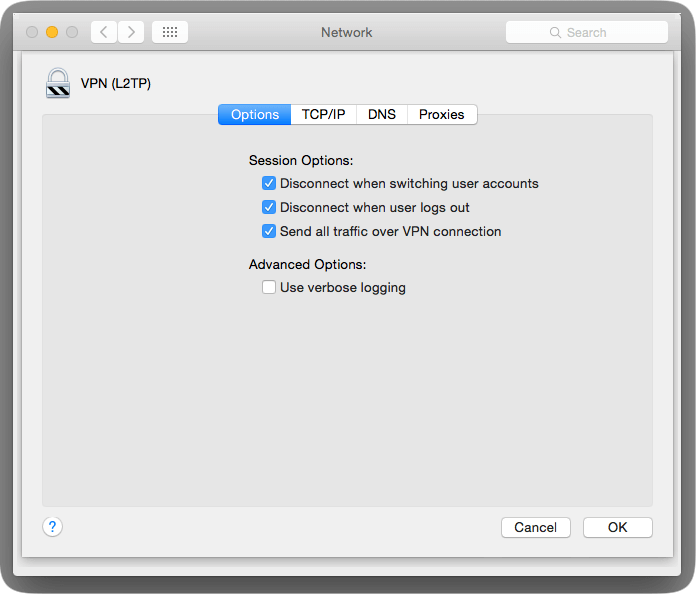 Then you should check the option to “Send all traffic over VPN connection” so that your client will, um, send all its traffic (including public internet-bound traffic) over the VPN when the VPN connection is active. 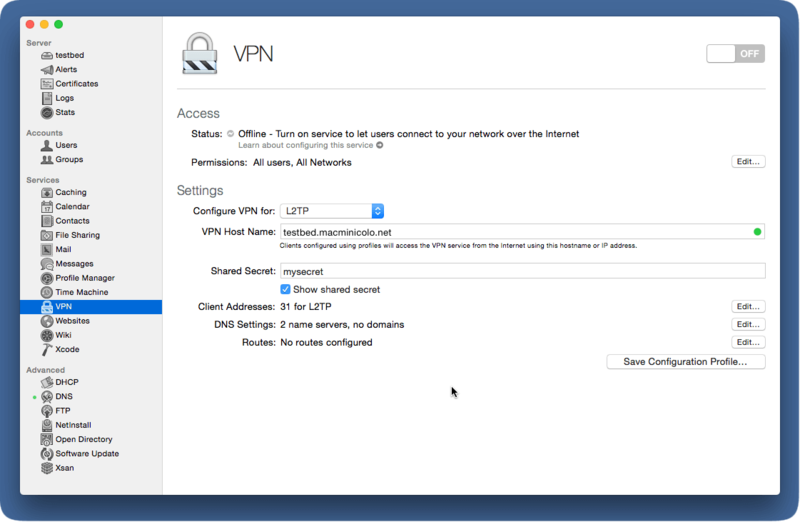 Otherwise, if you skipped the optional “Part II: Internet Routing” section, make sure to un-check “Send all traffic over VPN connection” (unlike the picture above). Press “Apply” to save changes. And now your client should be ready to connect to your server’s VPN. Just press “Connect” when you want make this happen. As I mentioned, this tutorial came from Rusty Ross (@ConsultantRR), a great hands-on consultant that works with a bunch of happy MMC customers on a wide range of topics, including setup, migration, troubleshooting, maintenance, networking, strategic planning, and creative thinking. He’s available for a quick-fix, a specific project, or a longer-term relationship. If you have questions, you can find us on Twitter @macminicolo. And if you’re looking for somewhere safe and connected to place a VPN server, check out our prices to host a Mac mini with us. 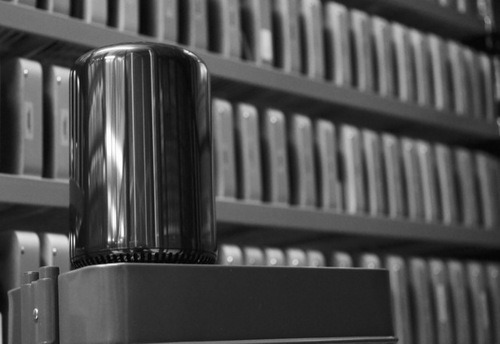 We’ve been working extensively with Mac minis for nearly 10 years. (Yes, we’re nearing the tenth anniversary for the more-popular-than-you-think Mac. They are great servers, come and try one.) When a new machine gets released, we often get asked for feedback and any opinions on the new hardware. So below are ten things we noticed about the new Mac mini. We’ll add a tear down of the Mac mini (iFixit has posted a great teardown) on this post as well as update with benchmarks compared to all the past Mac minis. Be sure to follow us on twitter so you know when that's posted. 1) The machine received a second thunderbolt 2 port and lost its Firewire 800 port. A few years ago, this would have been a big loss, but I don’t think it’s as big of a deal now. The Thunderbolt drives are getting less expensive and have more options available. And with the addition of USB 3 in the 2012 mini, that covers a lot of what people need for speed. 3) It's really looking like the RAM can no longer be upgraded by the user. We should have that confirmed soon. (Confirmed. See update below.) This option will be sorely missed by a lot of people. At least Apple has decreased the price of the RAM upgrades when you build and order a machine on the Apple Store. Also, nice to see the two higher versions come with 8GB of RAM by default now. 4) Since the Mac mini still offers HDD drives, I’m hopeful that we’ll still be able to upgrade the storage. (Confirmed: if a hard drive is ordered in the Mac mini, you can get to it and replace an SSD but it won't be easy. see Update below) As was before, replacing the hard drive is not covered under warranty. 5) On the previous mini there was one Gigabit ethernet port, and to get a second one you’d have to take the only Thunderbolt port. Now that there are two, you can have a second Gigabit port and a Thunderbolt drive. 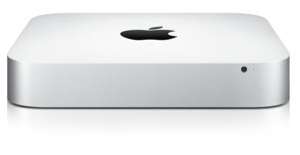 8) It’s nice to see the return of the $499 Mac mini. It started there, then the base price went to $599, $699, back to $599 and now a full circle back to $499. It's still incredible having a Mac under $500. 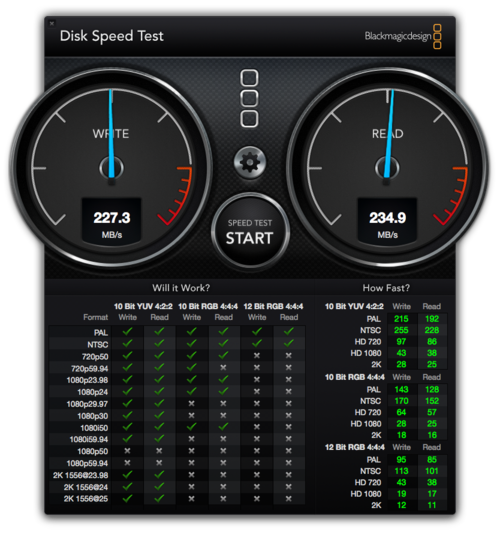 9) When ordering an HDD option, it looks like it is still a 5400RPM drive. That’s too bad. 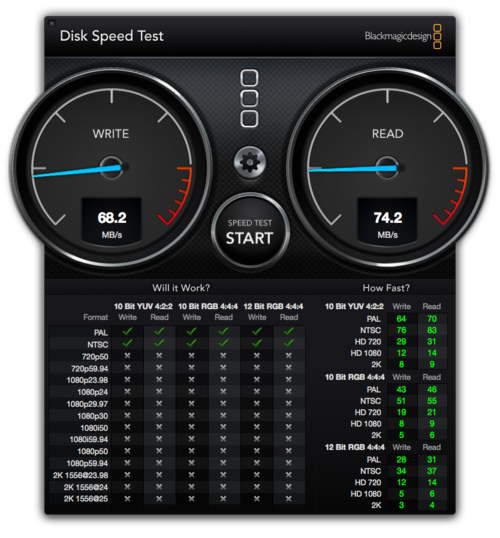 The 2011 Mac mini had the faster 7200RPM and that was a nice bonus. I guess we’re living in an SSD world now. If you want speed, you know how to get it. 10) Overall it’s a nice upgrade. Though to be honest, with these components, it really should have happened about 6 months ago. We look forward to getting our hands on the new Mac mini so we can see what's possible with the new hardware. 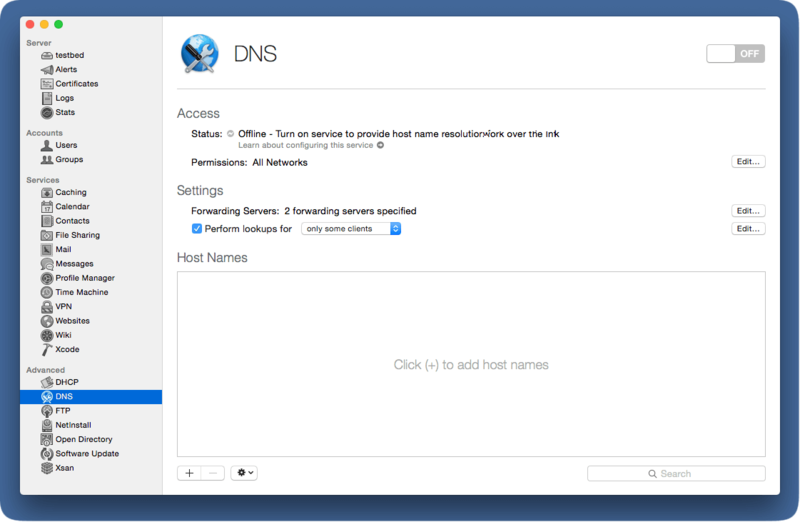 If you'd like to try a Mac mini as a server, we're offering a promo right now for just $10/mo. A while back, we wrote up a review about an HDMI adapter for a headless Mac mini and the post has been very popular. In fact, it has been so popular that the manufacturer of the adapter reached out to us to thank us for all the business we sent their way. These adapters really are great little units. 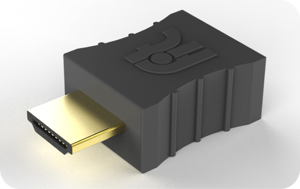 In our email exchange, they also mentioned their new product, a HDMI adapter that brings 4K. Wow. This would be ideal if you need to render for 4K, want a huge resolution for screen sharing, or you just need to test your software with 4K. We plugged one into a Mac mini, and sure enough, it gave the 4K option. (which looked huge on my 27in iMac) The adapter even showed the new generic 4K monitor that was improved with 10.9.3. Around here, we use the regular HDMI adapter because it accelerates the GPU and brings great performance in Screen Sharing. But, if you want the adapter with the 4K option, it's available on Amazon as well. Update: We've heard from some folks that their Mac won't show all the resolutions that these screenshots show. We've heard from the manufacturer of the adapters and they mentioned that it is a limitation with the OS X display applet. As a work around, they suggest the free app called "Display Menu" from the Mac App Store. One of the reasons people love a Mac mini server is they own the hardware and can upgrade or add-on as needed. We allow for BUS powered drives to be attached to Mac minis for extra storage or for backup of their Mac mini server. This is a great way to get large amounts of data to or from the data center quickly. For instance, a couple years ago we partnered with a Canon program where photographers would take photos in the field, overnight us a small external drive with hundreds of GBs of photos, and we’d plug it into their Mac mini so all the photos were available online very quickly. In our data center, we’ve always preferred BUS powered drives for a couple reasons. (In other words, drives that are powered by the port on the Mac.) First, they require less power and space (both of which are expensive in a data center.) Second, over the years we’ve seen a number of hard drive external power adapters burn out. It seems that much attention is given to the drive, but the quality isn’t there for the power adapters. The downside to BUS powered drives is that they usually aren’t as large in capacity. 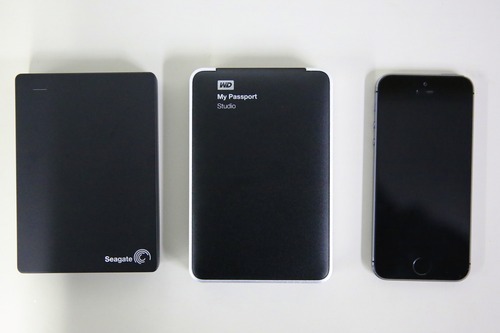 Up until recently, the maximum size of drive you could buy was 2TB. For most people this was plenty, but sometimes you just need more. 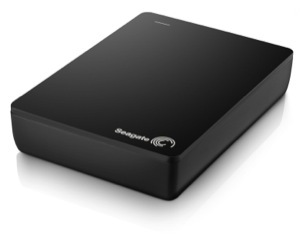 In January, Seagate announced a new 4TB BUS powered drive and it looked great. 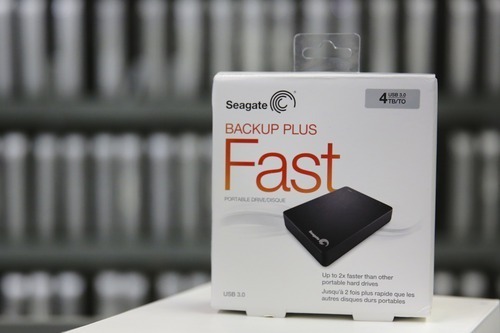 This drive is called the "Backup Plus Fast Portable Drive." Horrible name, but great potential. We now have one of the first drives shipped and we took a look for those interested in it. The hard drive ships in NTFS format, which is ideal if you are going to use it between a Mac and a PC. However, Mac OS X Extended is preferred if you’re going to be on a Mac only. (This can be done in Disk Utility of course. A tip: I wasn’t able to partition the drive right away. 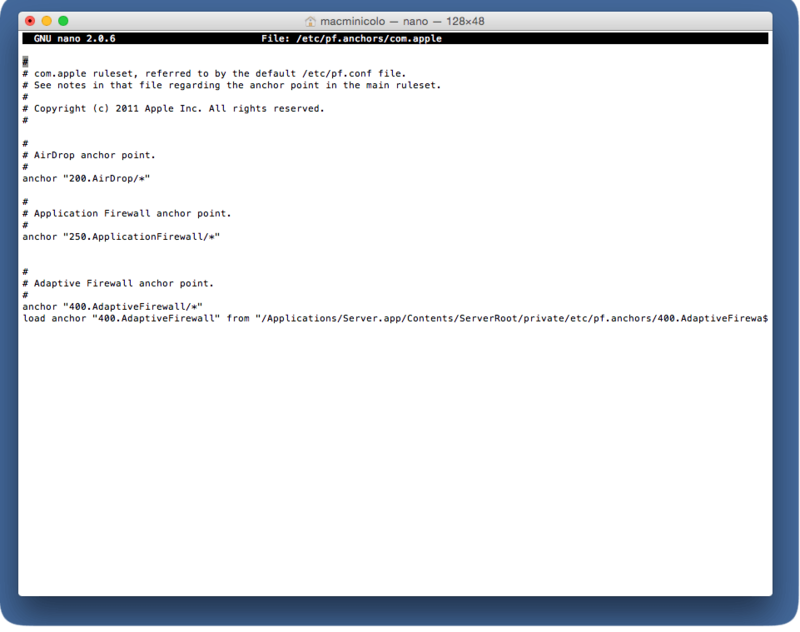 First I had to use the "Erase" option, then the partition option worked fine. Maybe a little bug?) When formatted for a Mac, the drive shows 4TB available, and 1.11GB used, which is likely the amount needed to keep the two internal drives configured in RAID 0. The drive ships with both a USB 3.0 cable and a USB 3.0 Y-cable. The latter is need in case your computer doesn’t provide enough power from just one USB port. However, on the 2012 Mac mini and the 2013 MacBook Air, the single USB is sufficient. If you want one for your Mac mini here, just contact us and we’ll get one lined up for you. IF you have any additional questions about the drive, you can reach us @macminicolo on twitter. 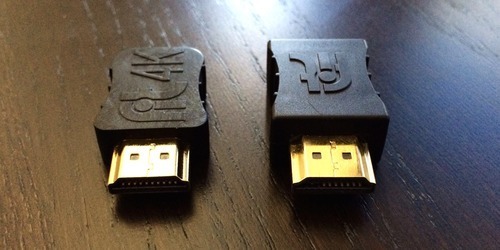 About a year ago, we blogged about how to build a dummy dongle to use with a headless Mac mini. This has been a very popular post. Adapters like this trick the machine to behave as if a monitor is attached. This change makes much more use of the GPU. This hardware hack has been great for years but we have something even better that comes with some real benefits. Another benefit is that this adapter uses the HDMI port, leaving your Thunderbolt port available for high speed external devices like a hard drive. 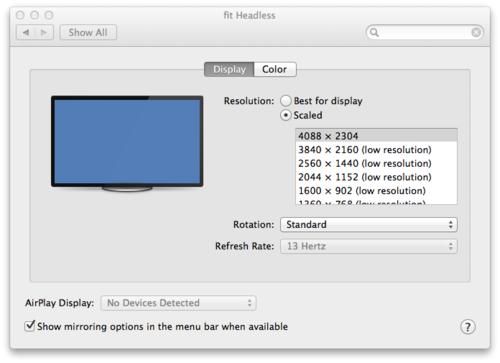 Finally, Mavericks has really dumbed down support for VGA resolutions. Since the last dongle used VGA, you were very limited on the resolution choices and they were all quite small. Since this adapter uses HDMI, you can even choose a 16x9 1080p resolution. (Screenshot) Keep in mind, if you are accessing a server remotely, you might consider keeping it a bit smaller to speed transmission. In short, this is a much better option in just about every single way. We have high stock here in the data center for our customers. If you're running a server or media mini at home you might want to take a look. You can order one right on Amazon. There is also a 4K option available. We've been hosting Mac minis for 9 years now. They are incredible machines but we're going to branch out a little. Today we also offer colocation of the new Mac Pro. This service can be found at MacProColo.net. For most people, the Mac mini will easily do the job and will also be less expensive for purchase and for colocation. In my opinion, I think most people will want the Mac Pro on their desk and the Mac mini in the data center. But for those who do need the power of a new Mac Pro, we're happy to offer you a spot in one of the best data centers in the world. As usual, happy to answer any questions @macminicolo on twitter or send us a note. There is a bug in the upgrade to Mavericks where the Energy Saver settings are changed. We've seen a number of machines lose the setting to "Start up automatically after a power failure." 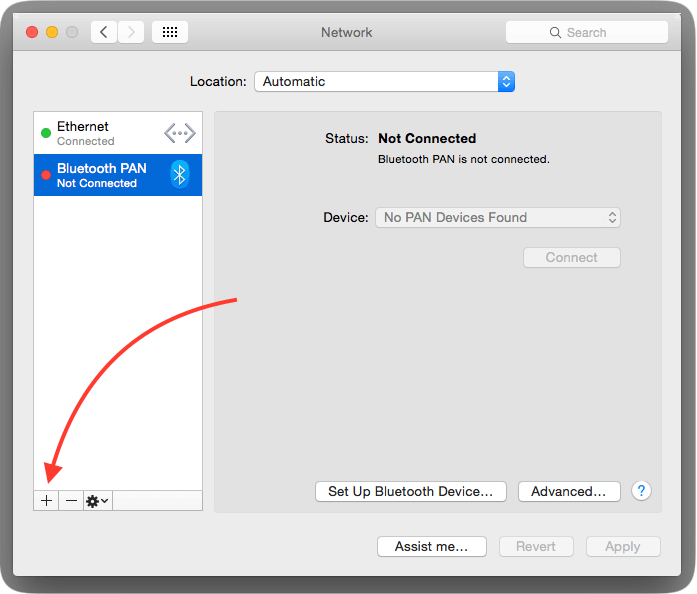 While the data center almost never loses power, this setting is critical in the control to remote reboot your Mac mini. If your machine was to freeze up, you can cycle the power outlet and the machine would come back. However, that won't work if this setting is off. 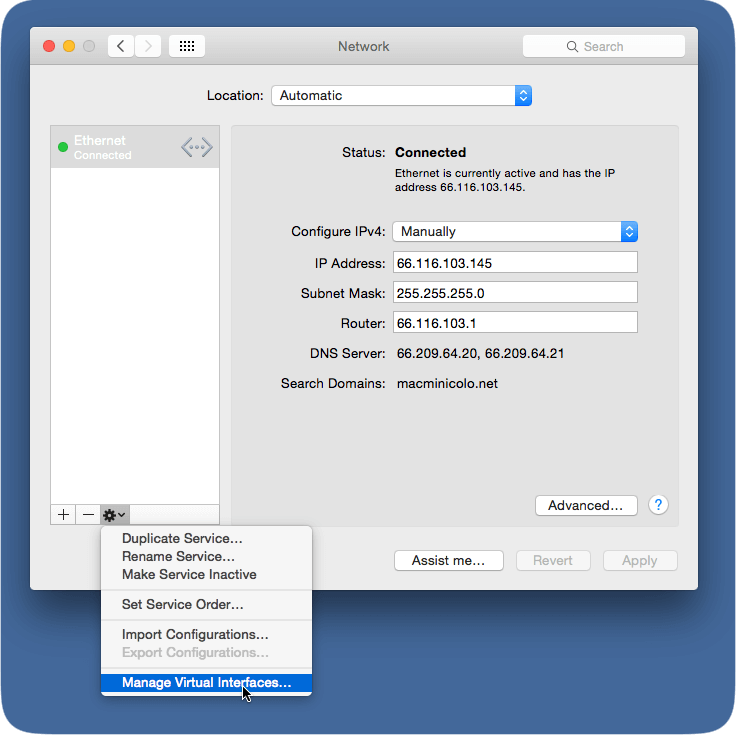 So, if you are running a Mac server here or in your office, take a minute to be sure this setting wasn't lost in your upgrade to Mavericks. 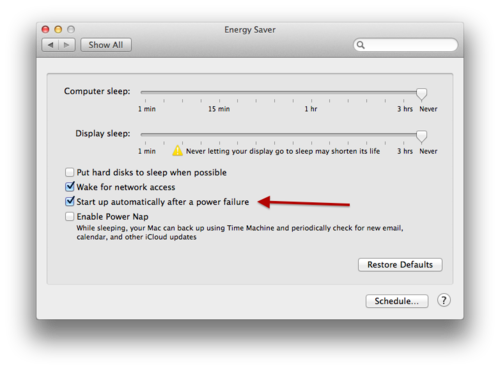 It can be found in System Preferences -> Energy Saver.